MISSION, KS--(Marketwired - Oct 17, 2013) - (Family Features) Millions toil away in their office cubicles, dreaming of owning their own piece of the American dream. Meanwhile, many entrepreneurial thinkers are using rough economic times as the catapult for making their small business dreams come true. With so many types of business models available, it can be hard to determine which one is the best fit for you. Commonly thought of as the most traditional of plans, this business model involves businesses housed in physical buildings from which they sell their products. One major advantage of brick and mortar businesses is the personal interaction typically achieved between consumer and owner. Due to the rising popularity of online shopping, many brick and mortar businesses are turning to the internet, combining a physical location with an online presence. The "bricks and clicks" model is typically used to describe a business with a both a retail and an online location. A major advantage of the brick and click model is it allows customers to see the product physically, coupled with the option to buy products with the convenience of a mouse click. One disadvantage of the brick and click model is the higher overhead required to run both a physical location and keep a website fresh and current. Many examples of successful bricks and clicks businesses are retailers which, in particular, sell clothing and footwear. Local customers can go in to try on the wares physically and then purchase from the comfort of their own home. A franchise is a business model that involves two parties -- a franchisor and a franchisee. Franchises are a good fit for those with an entrepreneurial spirit but who also may lack business experience and would benefit from the structure, support and guidance the franchise model provides. To become a franchisee, an entrepreneur pays a fee and/or shares the revenues of the business. Because a franchise is owned by a franchisor, the franchisee must follow set guidelines. If you're trying to narrow down your options, knowing your location and community is essential. Some franchise opportunities, such as The UPS Store, specialize in building franchise opportunities in small towns and rural locations. As many of these areas are underserved in business, packing and shipping amenities, such franchise models deliver a sought-after service for other small businesses and citizens within the community. Having a clear understanding of your community's needs can ensure your new business venture is successful and profitable. It's also important for franchisees to think outside the box when selecting their location. For example, some businesses, such as The UPS Store, can thrive in non-traditional locations, such as hotels, rural communities, university campuses, military bases and convention centers. 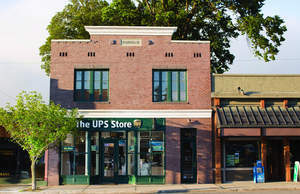 For more information, visit www.theupsstore.com/mainstreet. Without a physical retail structure, the direct sales model sells products through independent distributors who specialize in face-to-face experiences with the consumer. One main benefit of direct sales is the ability to sell without overhead or supply costs of running a facility. Many direct sales entrepreneurs purchase their products directly from the parent company piecemeal, so no additional storage space is needed to house the product.